Saint Scholastica, Virgin - My Catholic Life! Saint Scholastica was born in the decades after the last Western Emperor was forced to abandon the crumbling city of Rome in 476. Power was concentrated in the East, in Constantinople, where the real action was. Many centuries would pass until the Renaissance would cover Rome again in its classical glory. But what happened in Western Europe between the end of the Roman era in the fifth century and the dawn of the Renaissance in the fifteenth? Monasticism happened. Armies of monks founded innumerable monasteries crisscrossing the length and breadth of Europe like the beads of a rosary. These monasteries drove their roots deep into the native soil. They became centers of learning, agriculture, and culture that naturally gave birth to the dependent towns, schools, and universities which created medieval society. Monks transformed the farthest northwestern geographic protrusion of the Asian landmass into, well, Europe. Saint Benedict and his twin sister, Saint Scholastica, are the male and female sources for that wide river of monasticism which has carved its way so deeply into the landscape of the Western world. Yet very little is known with certainty about her life. Pope Saint Gregory the Great, who reigned from 590–604, wrote about these famous twins about a half century after they died. He based his account on the testimony of abbots who personally knew Scholastica and her brother. Gregory’s biographical commentary emphasizes the warm and faith-filled closeness between the siblings. Scholastica and Benedict visited each other as often as their cloistered lives allowed. And when they met they spoke about the things of God and the Heaven that awaited. Their mutual affection grew out of their common love of God, showing that a correct understanding and love of God is the only source of true unity in any community, whether it be the micro-community of a family or the mega-community of an entire country. The Benedictine monastic family tried to replicate the common knowledge and love of God which Scholastica and Benedict lived in their own family. Through common schedules, prayer, meals, singing, recreation, and work, the communities of monks who lived according to the Benedictine Rule, and who live it still, sought to replicate the well-ordered and fruitful life of a large, faith-filled family. Like a well-trained orchestra, all the monks melded their talents into an overwhelming harmony under the wand of the abbot, until their common effort swelled over into the beautiful churches and music and schools that carry on today. The gravestones in monastery cemeteries often have no names engraved on them. The polished marble may say, simply, “A holy monk.” The anonymity is itself a sign of holiness. What matters is the body of the larger religious community, not the individual who was just one of that body’s cells. 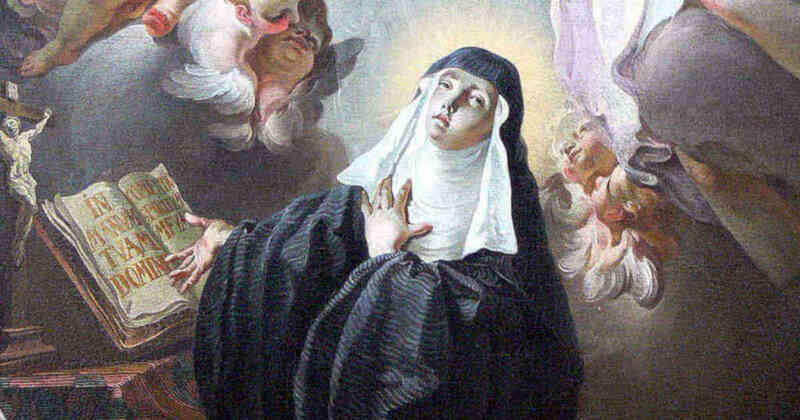 Saint Scholastica died in 547. Her grave is known, marked, and celebrated. She is buried in a luxurious sepulchre in an underground chapel of the monastery of Monte Casino in the mountains south of Rome. She is not anonymous in her resting place, like so many monks and nuns. But she is anonymous in that so few details illustrate her character. Perhaps that was by design. Perhaps it was humility. She and her brother are major religious figures whose stamp is still impressed into Western culture. Yet she is a mystery. She is known by her legacy, and sometimes a legacy is enough. In her case it is definitely enough. 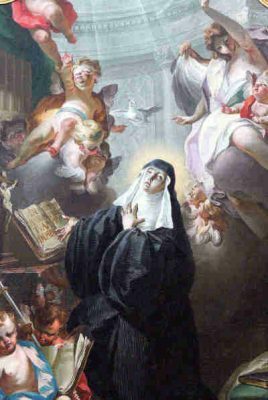 Saint Scholastica, you established the woman’s branch of the Benedictine Religious Order, and so gave Christian women their own communities to govern and rule. Help all who invoke your intercession to remain anonymous and humble even when developing great plans for God and His Church. You are great and you are unknown. Help us to desire the same.